Sugar selection is determined by the desired end product since different sugar sizes may play a role in baked goods’ appearance or taste. Some refining by-products may be used as an ingredient to add fiber content to prepared foods such as cereals. Sugar’s nutritional value—not simply that of beet-derived sugars—is the object of much debate and research surrounding the health concerns associated with consumption, and overconsumption in particular. Public health officials say reduced sugar intake would help reduce disease risk, including obesity and tooth decay. 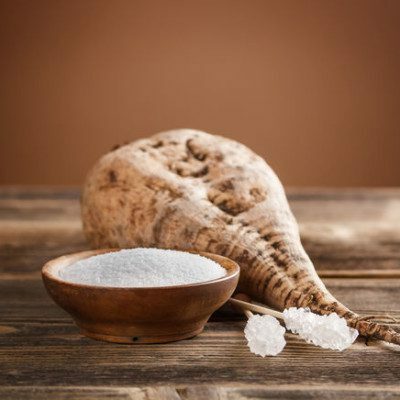 Many manufacturers utilize beet sugar when a granulated sugar variety is required due to its wide availability. A wide selection of sugars are available to the commercial baker. These include various sizes of granulated sugar as well as Baker’s special sugar, powdered sugar, fondant and icing sugar; and baker’s divert sugar. The latter have some of the finest granules available.6 Its use in bread is usually 3-5% on flour weight. In cakes and other applications, it can go higher than 50% on flour weight. Charles, Dan. “As Big Candy Ditches GMOs, Sugar Beet Farmers Hit A Sour Patch.” NPR, NPR, 12 May 2016, www.npr.org/sections/thesalt/2016/05/12/477793556/as-big-candy-ditches-gmos-sugar-beet-farmers-hit-sour-patch. Last accessed 22 October 2018. “Refining & Processing.” The Sugar Association, www.sugar.org/sugar/refining-processing/. Last accessed 15 October. 2018. “Sugarbeet History.” American Sugarbeet Growers Association, americansugarbeet.org/who-we-are/sugarbeet-history/. Last accessed 15 October 2018. “Background.” USDA ERS – Background, www.ers.usda.gov/topics/crops/sugar-sweeteners/background.aspx#production. Last accessed 15 October 2018. “Types of Sugar.” The Sugar Association, www.sugar.org/sugar/types/. Last accessed 15 October 2018. “Sugar’s Role in Food.” The Sugar Association, www.sugar.org/diet/role-in-food/. Last accessed 15 October 2018. “WHO Calls on Countries to Reduce Sugars Intake among Adults and Children.” World Health Organization, World Health Organization, 17 May 2016, www.who.int/mediacentre/news/releases/2015/sugar-guideline/en/. Last accessed 12 October 2018. Sugarbeets, hort.purdue.edu/newcrop/afcm/sugarbeet.html. Last accessed 15 October 2018.